So before we get into all of the health and wellness stuff, I have to discuss something important that I am currently dealing with and need support for. After many months with short hair, I decided that I am going to grow my hair out. It's been rough y'all. I'm mostly jesting about needing support, but yeah, it's definitely been super annoying because I have curly hair. As you can see, that gets tricky as my hair starts getting longer, because my hair just looks like one big cowlick. 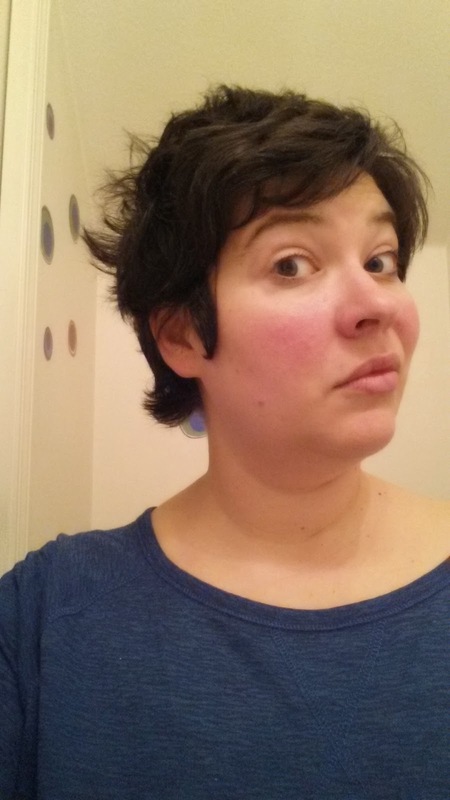 I also have a mini mullet thing going on, so it's just awkward all the way around. It makes me wish that I had hair that I could pull out and be long, like Brush and Grow My Little Pony. Does anyone remember those? Listen to this if you dare, because it's like an ice pick to the brain. What the hell drugs were everyone on in the 80's? And I say that as someone who grew up in the 80's. In all seriousness I had one of those My Little Ponies and they were pretty rad, to use an 80's colloquialism. Ah well, on to the fitness stuff. I actually didn't end up doing yoga or Richard today, or even a walk. Believe you and me, Molly has made me well aware of the fact that we didn't go on our walk today! I actually did something I've never done and went and got a flu shot. I have been dead set against getting them for years, but I had such a horrible bout of illness last December that it made me rethink my stance on it. In January someone that Eric knew who was around our age passed away from H1N1, which really made me decide that it would be wise to get one. The nurse who did my shot was very nice and laid back, and we had a great conversation about the flu and of course this Ebola panic that's going on. We both agreed that 3 people is not a crisis or an epidemic, and that people need to quit flipping out. She said that the one good thing to come out of it would be for people to be concerned enough about being ill to actually come in and get a flu shot. ANYWAY, after I had the shot I felt really off, drained, mentally foggy and fatigued. I'm not sure if that's all in my head, or if the side effects of the shot really kicked in that quickly. I decided that it would be good to just take it easy today and then start up all my walking and stuff tomorrow. This will mean Sunday isn't a rest day, but that's okay by me. I also cheated and weighed myself this morning, which is bad of me but I just can't help it! Short of having Eric hide the scale from me I'm always going to check it I guess. I didn't record the number officially, but I am definitely pleased and the scale is going in the right direction. I put on a pair of jeans today that was uncomfortably snug last week, and I could tell they were looser in the thigh area. On a food note, I was so proud of myself last night. We went to the movies to see Gone Girl (pretty good but didn't blow me away), and even though I would have really liked a treat or some popcorn, I decided it wasn't worth it and didn't get anything. It would have put me over my calorie macros for sure, and since my aunt and I will probably indulge on Saturday night, I'd rather just way until then. I did almost have a tea crisis on my hands today at the store. I went back to see if they had anymore of that coconut chai tea, and they didn't have any on the shelf!! I just kept standing there as though it would magically materialize, or if maybe I was just missing it, but no coconut chai. I finally started digging on the shelf, and there were two lone boxes of it shoved behind a bunch of other boxes. WHEW!! I grabbed them both! My question is what asshat hid the boxes behind there?! The menu today was good, although I did change things up. Again I forgot to take a picture of my burrito because I was too busy trying to cram it in my mouth, but since I rarely meet a breakfast burrito I don't like I was pretty happy with it. I think next time I would add some potato to it, just because breakfast burritos are 800 times better with some potato. And for the record, I am still hopelessly inept at wrapping burritos! So, I was supposed to have leftover peanut and chicken noodles that I made last night for lunch. But last night after dinner I was feeling pissy because I didn't like dinner, and was frankly hungry about an hour after I ate. I managed to not snack, but I was awfully grumpy about the whole thing. In the spirit of enjoying my life I just thought to myself, why would I eat those noodles for lunch and be unsatisfied, then possibly snack the rest of the day? So I decided to eat something I really liked and would be happy with. Naturally since I am a sweet potato crackhead I ate a baked sweet potato and then picked out the chicken breast from the noodle leftovers so that I had some protein. Crisis averted! I snacked on the chicken while I was waiting for my sweet potato to heat up, then once it did I sat down and really savored it. So freaking good. This is another Runner's World recipe, and you are lucky you got a picture of it because I couldn't wait to dive into it! 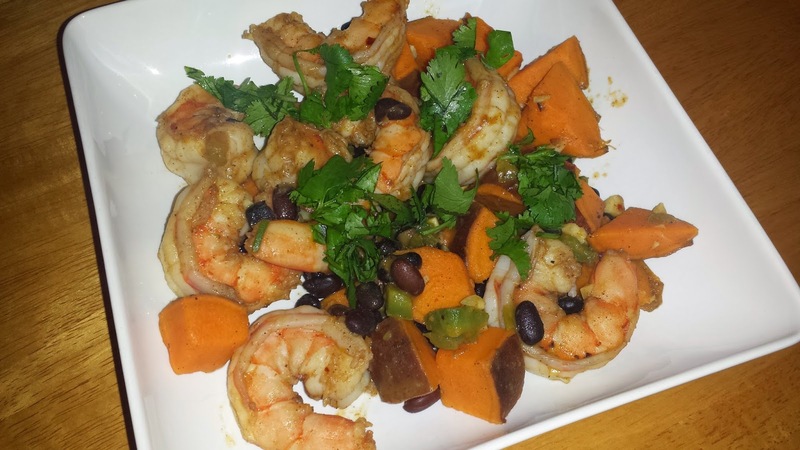 It's shrimp, sweet potato (I know, I have a problem) black beans, jalapeno and garlic sauteed with Jamaican jerk spice and a small amount of oj. I love all of those things so I knew I'd be into this. I did reduce the amount of jerk spice the recipe called for, which was two tablespoons!! I used about one and a quarter, because holy crap, I didn't want my head to blow off. I tolerate spice pretty well, but two tablespoons worth of jerk spice is insane. If you've never used it it's actually pretty awesome, but too much will have you regretting life. I warmed up a couple of corn tortillas to eat with this and it was great. Definitely will be making it again.